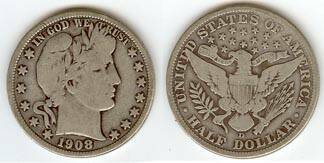 Below is a list of some of the coins we use for crafting our coin rings. 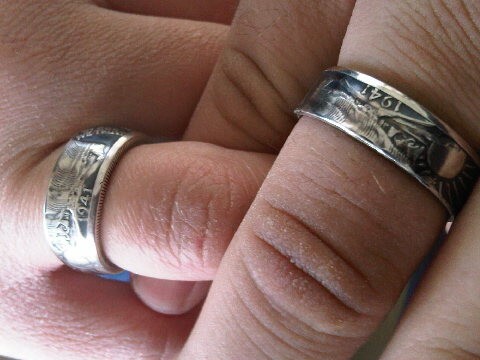 Not all silver coins are suitable for making coin rings due to the nature of their design. We have chosen the coins that are the most suitable and affordable. The following list includes photo examples of the coins we use and a description of the features found on the finished ring. We will sometimes use the back side of the coin for the outer band of the ring. 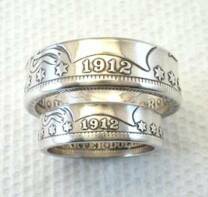 This is called a Reversed Double Sided coin ring. 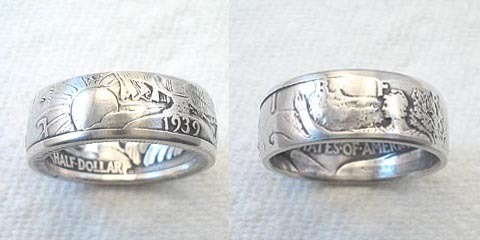 The date on this type of ring will be found on the inside band of the ring. The outside band will read "United States of America". 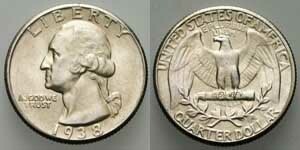 On the outer band of the Washington quarter you will find the Date, "in God trust" and "Liberty". 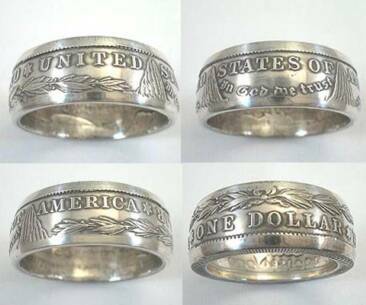 On the inside band you will find "United States of America" and "Quarter Dollar". 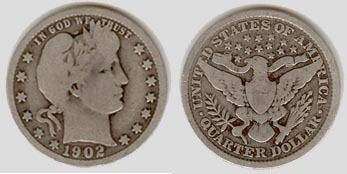 The Barber Quarter is one of our favorites. As a ring this coin looks best with just the high spots and rims polished. This gives nice contrast between the background and the polished raised areas, which will stay polished with normal everyday wear. 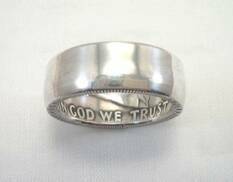 On the outer band you will see the date, stars and "In God We Trust". The inside of the band will read, "United States of America" and "Quarter Dollar". 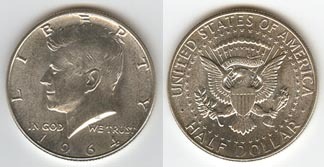 1964 is the only year that Kennedy Half Dollars were made with a 90% silver content. 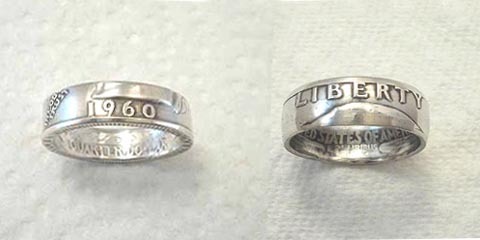 On the outside of the band you will see the date, "In God We Trust" and "Liberty". 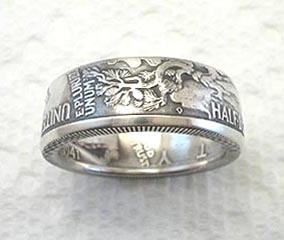 On the inside band you will find "United States of America" and "Half Dollar". 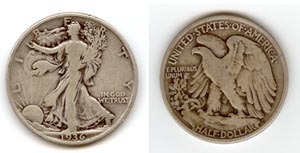 This is an excellent coin to reverse with it's patriotic phrase "United States of America" showing boldly on the outside band as well as "Half Dollar". 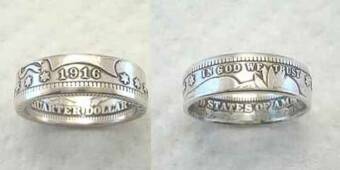 The Franklin Half Dollar makes a very nice coin ring with the words "Liberty" and "In God We Trust" showing boldly on the outer band of the ring. The last two numbers of the Date are also visible near the edge of the outer band. 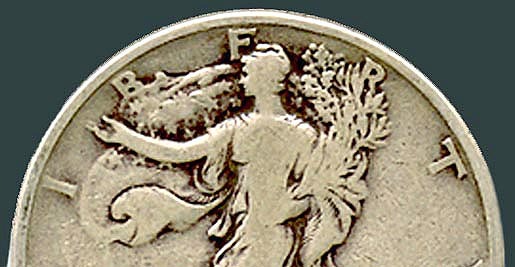 The Walking Liberty Half Dollar is our favorite half dollar ring. It normally has deep relief giving it great contrast with the high spots lightly polished. 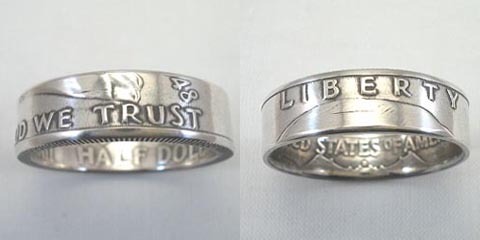 On the outer band you will see the Date, "Liberty" and "God Trust" in small letters. It also shows the Rising Sun and Liberty's Head. 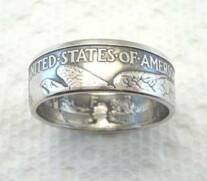 On the inside band you will find "Half Dollar" and "United States of America".This coin makes a very 'Chunky' Ring. 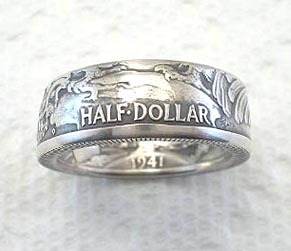 The Barber Half Dollar is another very popular coin ring. It has a very pleasant pattern of stars around the outside of the coin. On the outer band you will find the Date, a row of Stars and "In God We Trust". 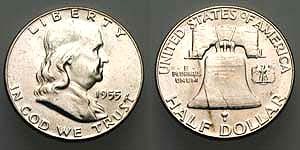 On the inside band you will find "Half Dollar" and "United States of America". 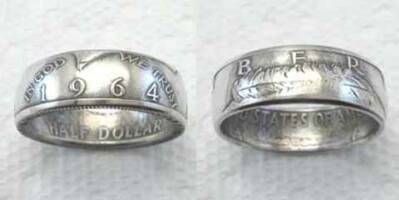 Barber Half Dollar Rings cost a little more due to the cost of the coin. Please view and sign the guest book on our home page. 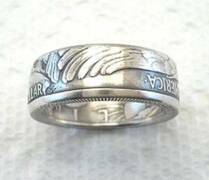 This is a "Reversed" Morgan Silver Dollar ring. 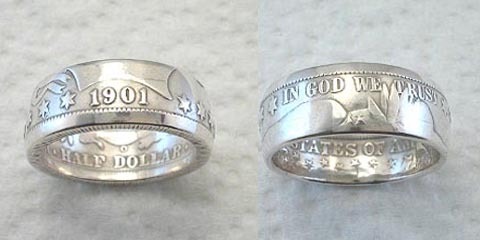 "United States Of America", "One Dollar" and "In God We Trust" can be seen on the outer band. 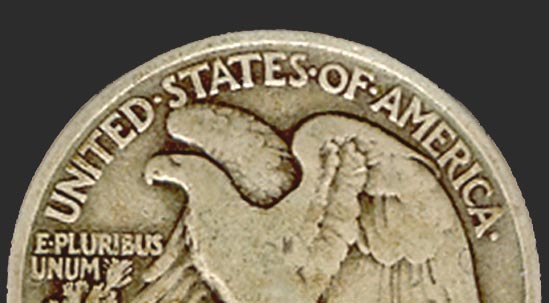 The Date and "E Pluribus Unum" can be seen on the inner band. These coins are 90% Silver.